The Department of Theatre Arts facilities are housed in two complexes — the Jerry Herman Ring Theatre and the Hecht Rehearsal and Studio Complex. The Alvin Sherman Family Stage in the Jerry Herman Ring Theatre can be configured as a proscenium, thrust, or arena stage. This facility has updated sound and lighting systems, including an ETC ION lighting console and a digital sound mixer. The production facilities for this theatre consist of well-equipped scene, costume, and electrics shops. The box office uses a fully computerized ticketing system. The Hecht Rehearsal and Studio complex consists of a black box theatre, four rehearsal studios, and a design studio. 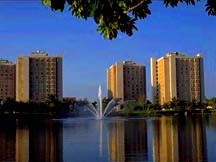 The Department of Theatre Arts' rehearsal studios, as well as most of the faculty offices, are located on the second floor of Hecht Residential College. They consist of an acting studio, voice studio, dance & movement studio, and improvisation Studio. The dance & movement studio also serves as a rehearsal space for the Jerry Herman Ring Theatre productions. Among the studios and offices is the Department of Theatre Arts’ Black Box Theatre. The theatre is an intimate 60-seat space that is used for workshop productions and readings, as well as a classroom space. With its fully equipped lighting system, it also offers design students opportunities to work in a small venue. The design studio is located in Hecht Residential College Building. Besides the traditional drafting tables, this studio contains a fully miniature lighting grid system, with a Strand CD-80 dimmer pack and a ETC Expression lighting console, and a SMART Board. The Jerry Herman Ring Theatre presents a full season of exciting theatre on the Alvin Sherman Family Stage. All performances feature UM students. Click here to go to the website.